Everyone loves that feeling of walking out of work on the last day before a vacation, knowing that all the daily troubles of the job can be forgotten for a little while. Or that feeling of waking up ill and exhausted but knowing that you can call in sick and take time to recover, because you’ll still get paid. But imagine if these feelings were just wishful thinking because you lived in a country where paid vacations and sick leave weren’t the norm. Which Countries Have The Most Public Holidays? National holidays give us all the chance to enjoy some extra time with friends and family, and they can also play an important role in national identity and patriotism. All of which means that the citizens of Cambodia must be feeling very fortunate with their 27 paid public holidays a year. Iran also has that many public holidays, but unfortunately for its citizens, none of them are paid. 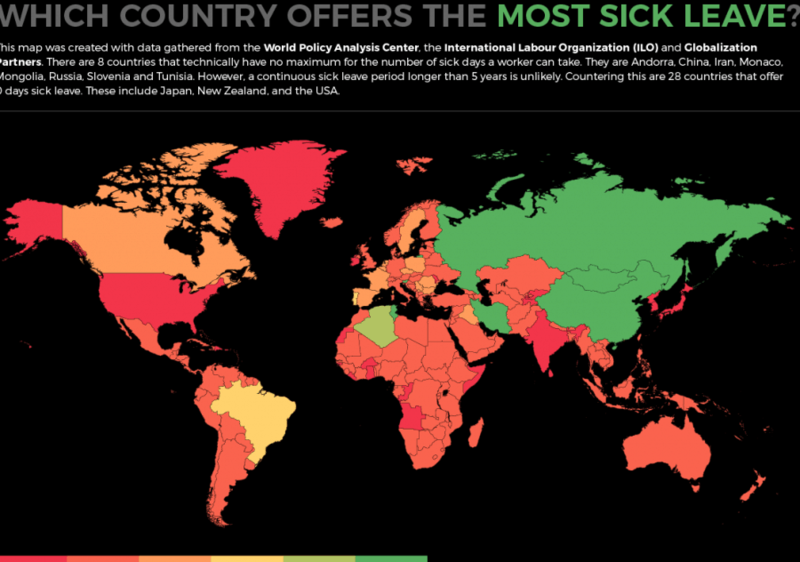 Which Countries Offer The Most Sick Leave? No matter how committed you are to your work, sometimes you need a break because you’re ill. This could be a short term virus that lays you low for a few days or something more serious that keeps you out of action for months at a time. If it’s the latter, countries like Russia and China are the best places to be because they give you some kind of sick pay for the entire duration of your illness. 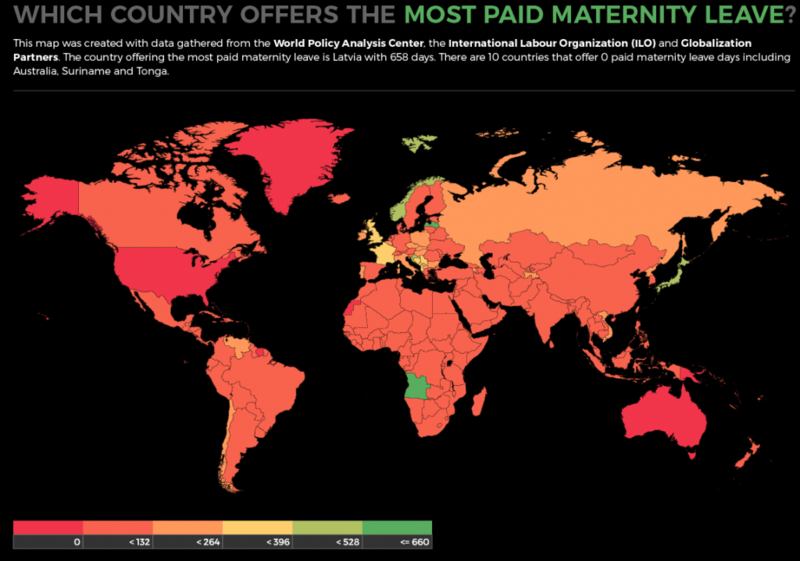 Which Countries Offer The Most Maternity Leave? Pregnancy and childbirth are magical times for a new mother, but also very difficult and painful times that can mean time off work, while even the most career-driven woman will want some time off to spend with their newborn before returning to work. New moms in Latvia are particularly fortunate in that respect as they get an incredible two years’ paid maternity leave, which must be the envy of women in Australia, where there’s no paid maternity leave as standard. Which Countries Offer The Most Paternity Leave? Not many countries offer a good deal on paternity leave, with some not even offering any paid or unpaid time off. France and Spain allow new fathers to take over 1,000 days of paternity leave, though mostly unpaid. Around the world, it’s clear that dads need a better deal. Which Countries Offer The Most Time Off Overall? Russia might not seem like everyone’s idea of a great place to work, but the data clearly shows that there’s no country out there that gives both men and women a great deal when it comes to potential time off. Women can take up to 3,093 days, while it’s 2,953 for men, and while obviously they couldn’t all actually be taken, it’s still a sign that Russians have a good thing going when it comes to needing time off work. That’s something we all need and this research shows just how much where you live affects what kind of time you can take off work and what your chances are of getting paid for it. So, do you feel like you’re getting a good deal now that you know? About the author: James Ellaby is a freelance writer, journalist, content marketer and researcher working on behalf of NeoMam Studios.